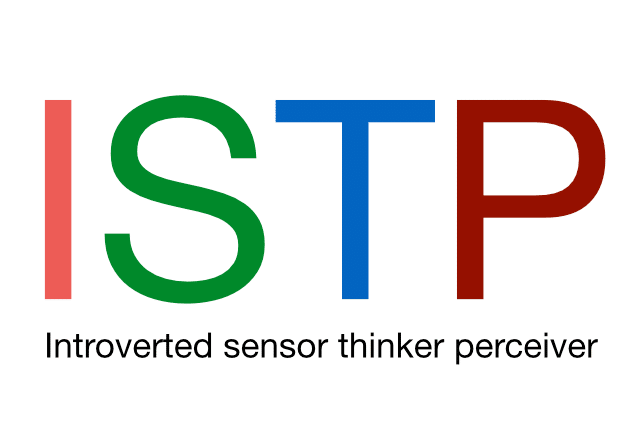 The Perceiver element of the ISTP personality type means that Sensing is extraverted with this personality type and Thinking is Introverted. Their preference in their processing is how they take in information (perception) which in this case is through Sensing rather than Intuition. 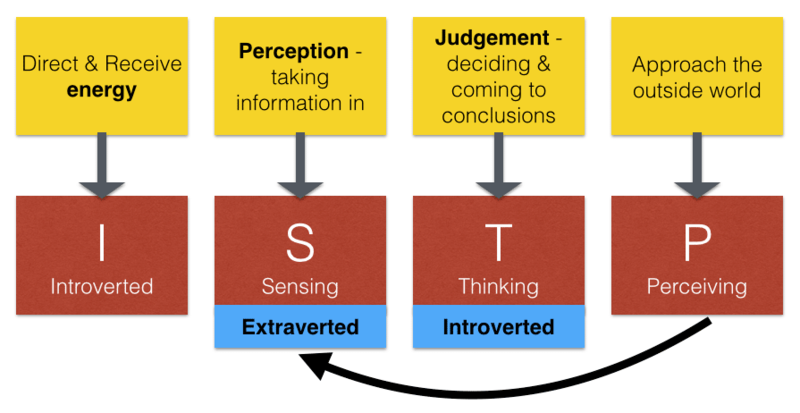 Their personality dynamic is therefore Introverted Intuition with Extraverted Sensing. Their third preference is Intuition and their inferior function is Extraverted Feeling. My Cousin – On the outside, He looks more like an extrovert but he is not. We can say that he is an Introvert exhibiting some extrovert behaviour at the same time. Even though he talks way too much, he is probably one of the best listeners I’ve known. When someone talks he is all ears and all there 100%, but without any exception he always has a long speech to make after he listens – usually commenting on or criticising something- non-stop until someone stops him. He is so well informed about world matters, and he loves history and its connection to what’s going on around us now. If you catch him watching the news or something historical you can always expect a prolonged lecture on the subject. He is very laid back and projects get postponed all the time but when he does something he gives it his best shot and does a fantastic job. He says he needs to think about it first but this thinking can take months even before a simple job such as pruning a tree. He normally likes his own company or having just a few friends or relatives around but he can also manage well in crowds. His wife is a complete extrovert and he can go along to parties and do all those things that extroverts would do. He is definitely a Sensor. He doesn’t mind his wife talking about fairies and other worlds, and he smiles about it, but he is absolutely down to earth. If you start talking about something abstract to him he wants to know what that means in practical terms. While working on something he is completely there and focused. You can trust him to do a great troubleshooting job as he pays so much attention to detail; he also enjoys assembling IKEA furniture. He can easily take risks as he is more concerned about what he thinks is right at a given time. He doesn’t believe in planning as he thinks that more than often things don’t go according to plan. His wife does all the planning and he does the perspiration if it’s something which is likely to yield tangible results, such as going grocery shopping if he is convinced that he’ll have an apple pie in the evening. He is a Thinker. People who know him closely can sometimes be shocked by the judgements he makes as they sound so cold hearted and we all know what a softie he is. However, when it comes to making decisions and judgements, He can easily dissociate himself. Of course, he needs all the facts and details and wants to be clear about a situation, and then comes the decision. You can always hear a very firm ‘No’ from him whenever he disagrees with someone – “No! It’s not like this, it’s like this because…” And he would feel for you if your feelings are hurt but that wouldn’t stop him from saying what he has to say. And those who know him well enough would respect even his unpopular decisions because they would know that his decisions are objective and that they come from someone who means well. He is a Perceiver and I don’t think he’s anywhere near the Judger end of the scale in any aspect of his life. He doesn’t care for time management or plans. He is the “take it easy babe” kind of guy. He sits there rolling his cigarettes, drinking his coffee, and either watching The News or the History Channel, or having a chat with someone, and it’s like time has stopped, world has frozen, and he doesn’t have any concerns. Yesterday he asked me over for coffee and I was there in 10 minutes to find his wife surprised and stressed to see me because they were expected to be somewhere in half an hour and he was still in his pyjamas. He doesn’t like to be rushed, and when his wife reminded him that he needed to get ready because the couple they would be visiting live by the clock, with his usual laid back attitude, he said “no worries, I can have my coffee with my lovely cousin and still shave and get dressed and be out of that door in 20 minutes”. That’s very typical of him. My step dad is an interesting character to observe. He has a very relaxed attitude to parenting my younger sister and yet he is very organised and strict with his university work. As he spends a lot of time alone I would assume he was introvert. He doesn’t like theories and isn’t very future oriented so I would say that he is more a sensor than intuitor.